Beginning in 1939 with ceremonial magician Dion Fortune’s Magickal Battle to keep the Nazis out of Britain, previously secret teachings became available and actionable to new students of the occult. When the last of the UK’s anti-witchcraft laws was repealed in 1951, the floodgates opened and writers like Gerald Gardner and Doreen Valiente started to form the liturgy for a new religion of witchcraft. At first this new religion, only called Wicca later, tended to focus on rites and festivals to promote a bucolic harmony with nature. 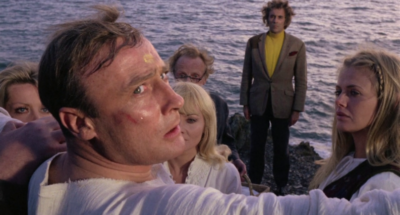 At its most radical, this early stage of the modern witchcraft religion included a “pagan” distrust of the laws of Christendom, a sense that the king (whether a literal monarch or any given figure of authority) could always be sacrificed for the harvest; a mentality beautifully rendered in 1973’s The Wicker Man. In the 60s and 70s, this new religion of witchcraft hooked up with psychedelics, feminism, and the space age and exploded into a thousand different schools and orders and even more books claiming “the one true authentic lineage” for themselves. This is where of the notion of witchcraft as a uniquely female power begins, and it is also where the movement takes on a more international character, no longer particularly a religion of Britain. Suspiria (1977) with its thoroughly Hellenistic coven in the middle of a German dance school and its loud psychedelic aesthetics fits this ethos to a T.
In the 80s and 90s, goth music and fashion (Psychic TV and Coil in particular were practitioners themselves) and popular films like The Craft (1996) brought a new generation to witchcraft, and they brought this mass media image of the witch with them to their practice. Here, the witch became postmodern and self-referential; the witch as chaos magician. Beginning in the Aughts, at the risk of becoming too navel-gazing and declawed, this witchcraft revival returns to its roots in what Peter Grey calls a “return to the Devil.” Witchcraft, to quote the Book of Babalon, as “force and fire.” As prophetic, apocalyptic, and potentially weaponized. As the will “to live deliciously.” 2015’s The Witch fittingly invokes both a historically accurate folk magick imaginary and a lightning-hot afterimage of newfound supernatural power that is thoroughly contemporary. It is into this world that The Love Witch walks with blood-soaked knife and chalice. * “Modern Witchcraft Revival” here refers to the specific series of movements described and does not encompass all global happenings related to witchcraft within this time period, especially those for which no revival is was necessary. Tickets for The Love Witch here.